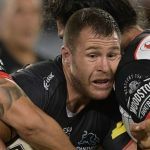 Leeds Rhinos have signed Australian forward Trent Merrin from Penrith, the Super League club confirmed on Thursday. The 29-year-old prop, who has played over 200 games in the NRL, becomes the Rhinos’ second marquee signing for 2019 after agreeing a four-year contract. Merrin, who played for New South Wales and won the last of his seven international caps against New Zealand in 2017, is the Rhinos’ fifth recruit for 2019 and follows the arrival of Samoa centre Konrad Hurrell. “I have done everything I possibly could in the NRL and this is a great opportunity for me to come to a great club with a fantastic culture and hopefully achieve some goals together,” Merrin said. The Rhinos kick-off their Super League campaign with a visit to Grand Final runners-up Warrington Wolves on February 2.